A few weeks back, James Hamilton of Econbrowser blogged on QE2 and asset prices. 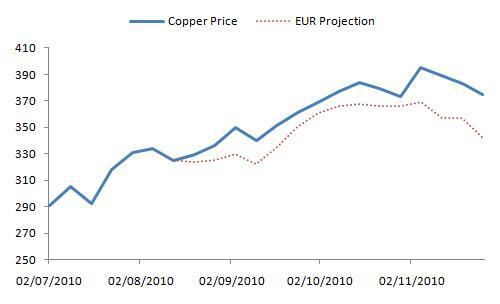 After observing the correlation between the EUR, Oil and Copper prices, Prof Hamilton posed the following question: suppose we knew the price of oil / copper at some point in time, but after that, we knew only the changes in the value of the EUR … how well might we have predicted the prices of Oil and Copper? It turns out that we would have been able to do a very good job – this remains the case. I do the trick a little different from Hamilton – I use weekly data, and the second oil and copper contracts (i am aware that the quarterly roll introduces some noise); I also extend the method to the SPX and the 15 Feb 2019 UST (ISIN US912828KD17). Finally, I start a little earlier than Hamilton – begining the week of the August FOMC meeting, when the Fed stopped allowing their asset book to run off – as that’s when WSJ Hilsenrath started hinting that the Fed may start buying USTs once again. That the price action across FX, commodities and bonds has been correlated is well established; however I think the degree of accuracy with which we might have predicted the price of oil / copper / equities given the EUR/USD is surprising. It suggests a common cause – I think that common cause is money. 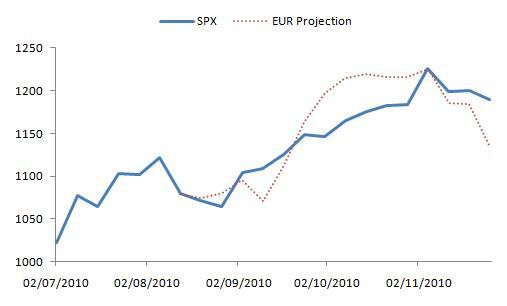 This is bad news for markets, as they are not going to get as much QE as they had thought. The lead into QE2 involved a broad consensus that the November announcement was an entree to a multi-trillion programme – say ~2tn … some like Krugman was talking about as much as 6tn of QE. From the distance of a few weeks, the political opposition to QE2 makes it seem unlikely that the Fed will more than the 600bn that was announced on 3 November. Assuming markets were priced for a 2tn slug of QE2 on 3 November, it seems reasonable to conclude that two thirds of the QE2 effect was ‘overdone’ and that even after the recent unwind there is more to go. 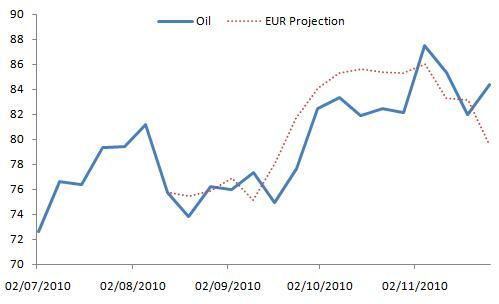 All things equal, if QE2 expectation were two thirds overdone, it looks like oil should fall back to ~80 bucks. The SPX can back to 1130 …. 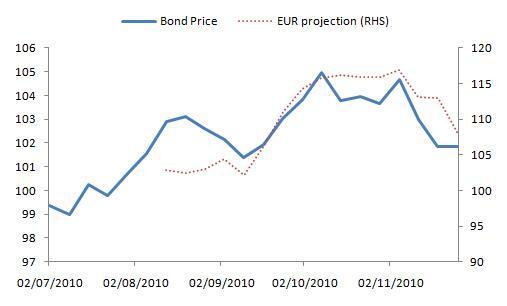 And the Feb 2019 back to ~105 (note that the bond doesn’t price like the other assets, so while I’ve followed the same process, I’ve put the EUR projection on the RHS, to allow for re-scaling). The good news is that this supports the Fed’s calculation that they can impact aggregate demand via asset price / wealth effects, which result from adjusting the size of their balance sheet. So … QE works — at least in the short run! Just now, however, most of the new news seems to be of the ‘risk off’ variety – I doubt equity / commodity / bond prices will remain inflated into Dec. My best guess is that the massive USD short will continue to be squeezed and that this will be bad for equities, bonds, and commodities. 0. Very nice analysis…once again! You’re good at this. 2. What about doing this analysis with oil instead of copper? 4. Re using 2nd nearest: you can either 1/ construct 1st nearest time series by splicing consecutive 1st futures contracts on roll off (or using 1st nearest until 2 wks before maturity to avoid noise and then switch to 2nd nearest which becomes 1st nearest two weeks thereafter) or use BMBG’s generic nth nearest futures time series. 5. Re high cross asset correlations: some UBS boys did some thinking and they reckon its because of dynamics in Chinese economy. This was on ZH a few months ago. Worked now. I think its because i was trying to embed a link into some text. but didn’t work. So i got rid of it, and voila it works!